Dozens of faith schools in England are preparing to switch to become academies in the next six months. The Catholic Church had at first been cautious about their schools becoming academies, which are semi-independent but state-funded. But in the past few months, nearly 40 have converted and many are expected to follow in the next six months. Secularists say the changes will "unleash an evangelistic approach to education". Nearly 800 Church of England and Catholic schools have registered an interest with the Department for Education about becoming an academy. And nearly 140 had converted by early November - 100 Church of England schools and 39 Catholic. Another 34 applications from C of E and Catholic schools have been approved, as have 19 from other Christian denominations, meaning they could convert in the near future. A total of 14 Jewish faith schools have become academies and applications from seven more have been approved. Vicki Hair, a solicitor at law firm Browne Jacobson, has been advising Catholic schools and dioceses. She told BBC News that in "the first months after the Academies Bill became an act, we saw a wave of schools who had been waiting for the legislation. Now that the precedent Church documents have been put in place, you will see a significant number of schools that are looking to convert". She added: "But, as with non-faith schools, there will always be some who, having looked at the facts and their circumstances, will decide not convert." She said the sticking points for the Catholic Church had been that it wanted to ensure that schools would retain their Catholic ethos and characteristics - and that land would not be lost. 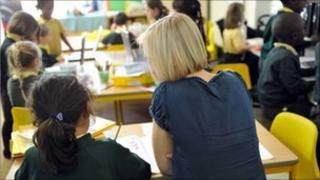 Under Labour, academies were mainly seen as a way of turning around failing schools and improving schools in poor areas. But the coalition government wants all schools to become academies, saying the status gives them more freedom and less bureaucracy. Since it came to power 1,200 schools have converted, bringing the total number of academies to 1,400. Becoming an academy means schools are no longer under the wing of the local authority, do not have to follow the national curriculum, can set their own pay and conditions for staff, and are exempt from some regulations covering other state-funded schools. Academies also receive money that would previously have been spent on their behalf by local authorities to provide services. Faith schools make up about a third of the 20,000 state-funded schools in England so a significant shift will help the government achieve its aim. Teaching unions have opposed the switch to academies, saying it is an untested idea which will lead to divided schools and a fragmented system. In the Catholic Church, decisions on whether schools should be able to convert if they want to are taken by bishops in the dioceses across England. Maeve McCormack, of the Catholic Education Service, said: "Over the last few months a number of Catholic schools have converted to become academies from across six of the 20 Catholic dioceses in England. "We expect that there will be more conversions in 2012 and a number of schools and dioceses are already exploring possibilities and holding consultations with parents about this. However, in some parts of the country there are Catholic schools which are happy to remain voluntary-aided and intend to continue as such, at least for the time being." Schools in the dioceses of Southwark and Westminster are among those consulting. In Liverpool, a decision has been taken not to go down the academy route. In the diocese of Nottingham, which covers five counties, four schools became academies in a trust in September, and seven more groups could potentially make the change by the summer. The National Secular Society says the change is worrying. The group's president, Terry Sanderson, said: "We worry that the programme is unleashing an evangelical approach to education. It is giving faith schools a free hand to conduct themselves as they wish. "The Catholic Church is making it clear that their schools are about creating new Catholics." Rob Gwynne, head of school strategy for the Church of England, said the main aim of its schools was to serve the community. And he said although the Church had earlier predicted a big movement towards academy status, it was no longer sure that rate of change would happen. "There has been some evidence of a slowdown, but it's a volatile situation," he said. He said many C of E schools were quite small and were daunted by "the complicated process" of becoming an academy.